Centuries before Asimov’s Three Laws of Robotics, before Fritz Lang’s “Metropolis” or Çapek’s “Rossum’s Universal Robots,” before Vaucanson’s digesting duck, people imagined, designed, built, and pondered the possibilities and pitfalls of creating artificial people, animals, and other natural objects. 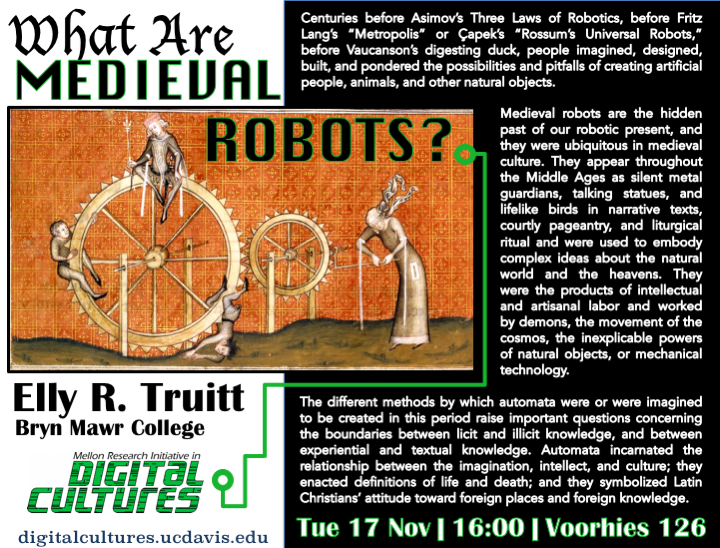 Medieval robots are the hidden past of our robotic present, and they were ubiquitous in medieval culture. They appear throughout the Middle Ages as silent metal guardians, talking statues, and lifelike birds in narrative texts, courtly pageantry, and liturgical ritual and were used to embody complex ideas about the natural world and the heavens. They were the products of intellectual and artisanal labor and worked by demons, the movement of the cosmos, the inexplicable powers of natural objects, or mechanical technology. The different methods by which automata were or were imagined to be created in this period raise important questions concerning the boundaries between licit and illicit knowledge, and between experiential and textual knowledge. Automata incarnated the relationship between the imagination, intellect, and culture; they enacted definitions of life and death; and they symbolized Latin Christians’ attitude toward foreign places and foreign knowledge. Elly Truitt is an assistant professor of history at Bryn Mawr College. Her research interests are in the history of medieval science, medicine, and technology. She is the author (as E.R. Truitt) of articles on the history of astronomy, pharmacobotany, timekeeping technologies, and the history of automata, and her work has been supported by the Mellon Foundation, the National Science Foundation, The Huntington Library, and the Chemical Heritage Foundation. Her monograph, Medieval Robots: Mechanism, Magic, Nature, and Art, was published by the University of Pennsylvania Press in 2015.